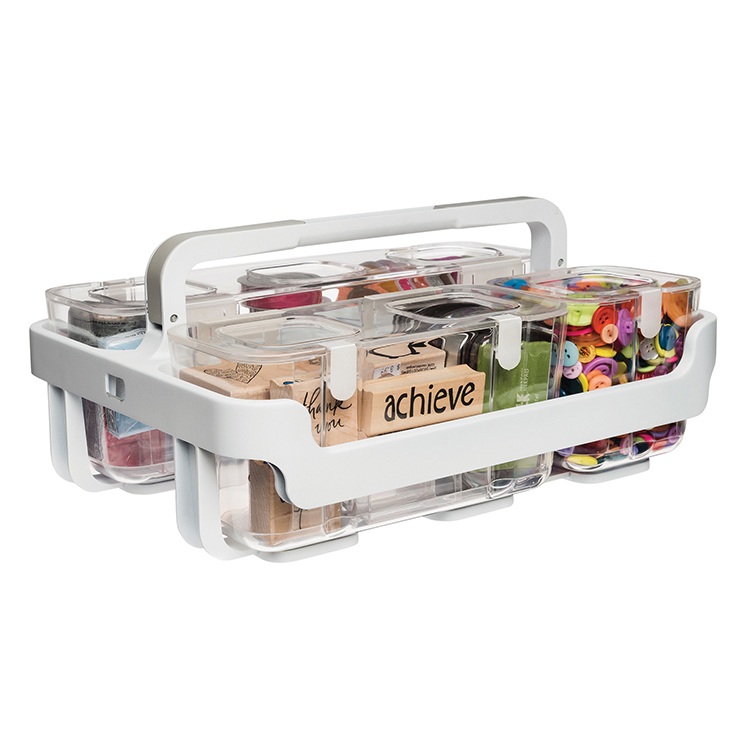 Just think how versatile, mobile and organized you’re going to be when you get your hands on the White Caddy Organizer with Small, Medium and Large Compartments by Deflecto. 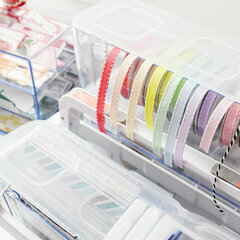 This innovative storage solution is the answer to getting your craft room or any other room organized in a snap! 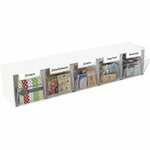 You are going to find so many things that need to be organized that you are going to want multiple Caddy Organizers. 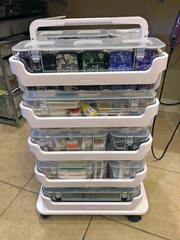 You will love that you can stack multiple Caddy Organizer’s on top of each with the lift and lock feature making it easy to take with you when you attend retreats, crops, classes or simply just want to stack multiple organizers in a closet. 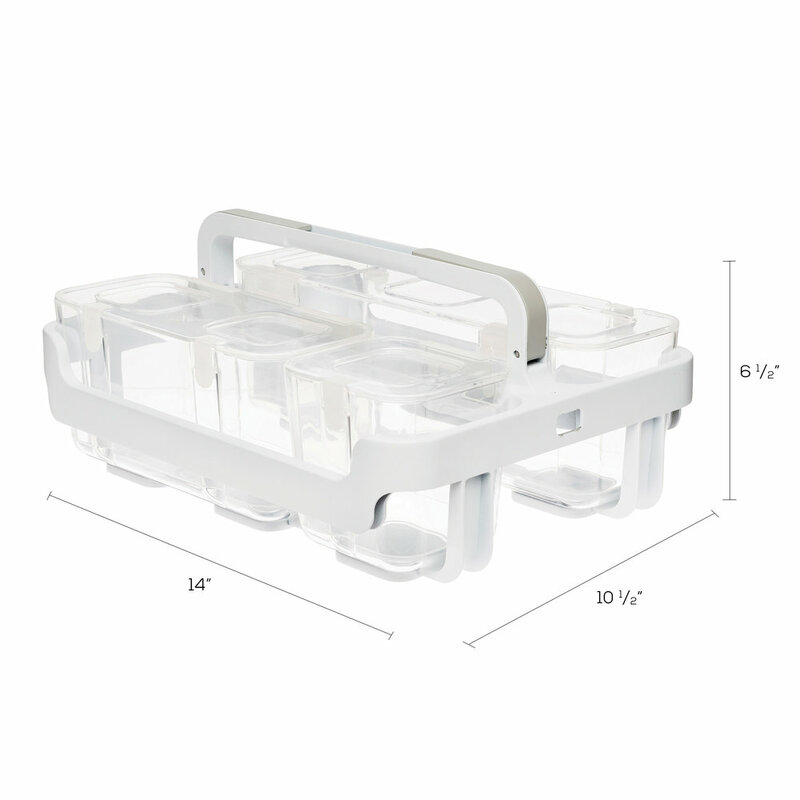 The included compartments can be stacked on top of each other while you’re working, or they can be mounted on the wall with the separately sold mounting bracket. 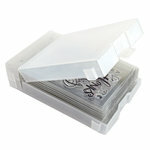 The clear compartments feature hinged, snap tight lids to keep your stored items secure. The lids are removable giving you easy access to your items and since the compartments are clear you will be able to view your stored craft items. 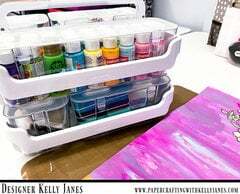 You will love how simple it is to remove one of the compartments from the Caddy Organizer and take it to your work space or toss it in your tote for your on-the-go crafting. 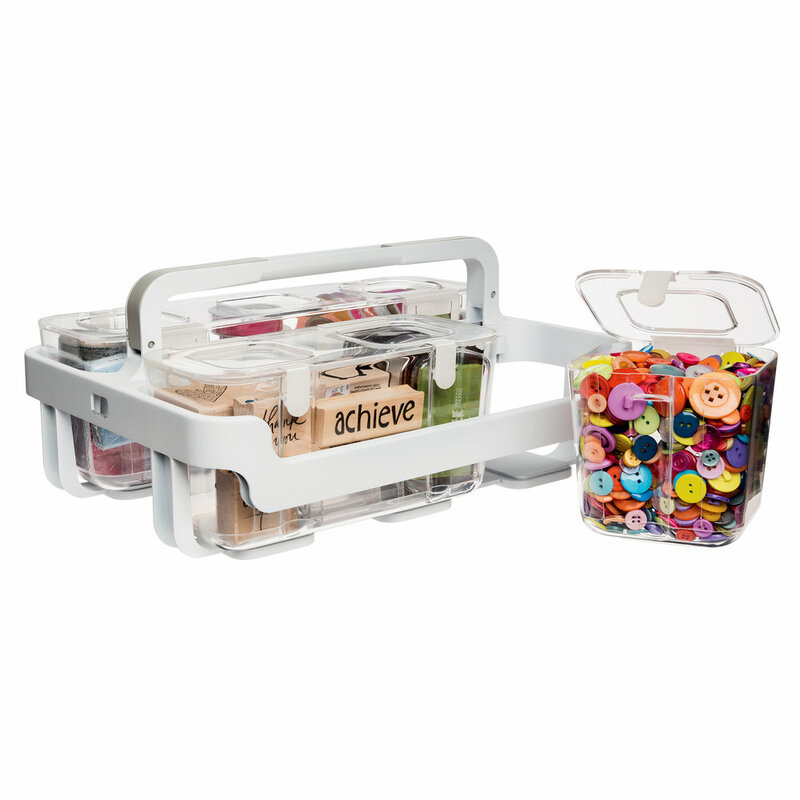 The Caddy Organizer is so versatile that it’s not only great for crafting, but it’s also great for the kid’s small toys or snacks when you’re running errands or attending a sporting event. You’ll quickly find that you will need one in the garage for tools, the classroom for crayons and scissors, the kitchen for your small gadgets or the office to store your paper clips, staples, rubber bands and more. The uses for the Caddy Organizer are endless! Please note that stored products shown in image are not included. 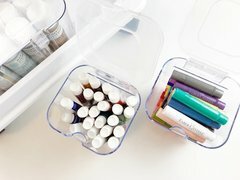 I spent the weekend organizing with my new Deflecto - Caddy Organizer and I am LOVING everything about this system. I constantly struggle to find the perfect solution to store my large selection of Zig Clean Color Markers, Water Brushes, Copic markers, Colored Pencils, etc. I found the medium storage bin is the perfect size to store everything and still be able to see through the container to quickly grab what I need. I even purchased a few extras to fill with the markers I need for the project I am currently working on. All the colors I need in one easy to carry storage solution. Great for crafting on the go. BRILLIANT!! This is the first product I have purchased through Scrapbook.com that I did not give 5 stars. The caddy is well constructed and the containers open & close nicely. But there was one problem: the manufacturer placed a cardboard "ring" all the way around the caddy with their product logo, details, instructions, etc. For some reason they saw fit to GLUE it to the caddy in 4 spots with a super sticky rubber cement type glue. There was no reason to do this because the cardboard fits under the handle and can't come off anyway. So, I was left with 4 spots of gummy glue stuck on the caddy compartments. Goo Gone did not work. I honestly hated to return the caddy. But it's kind of like having gum on your shoe. I will just put stickers over the spots of glue I couldn't pick off. I'm very happy getting the Deflecto Caddy Organizer. I've organized all of my Tim Holtz ink pads, Markers, Blending tools, it's perfect for all your scrapbooking needs. Can't wait to order more. 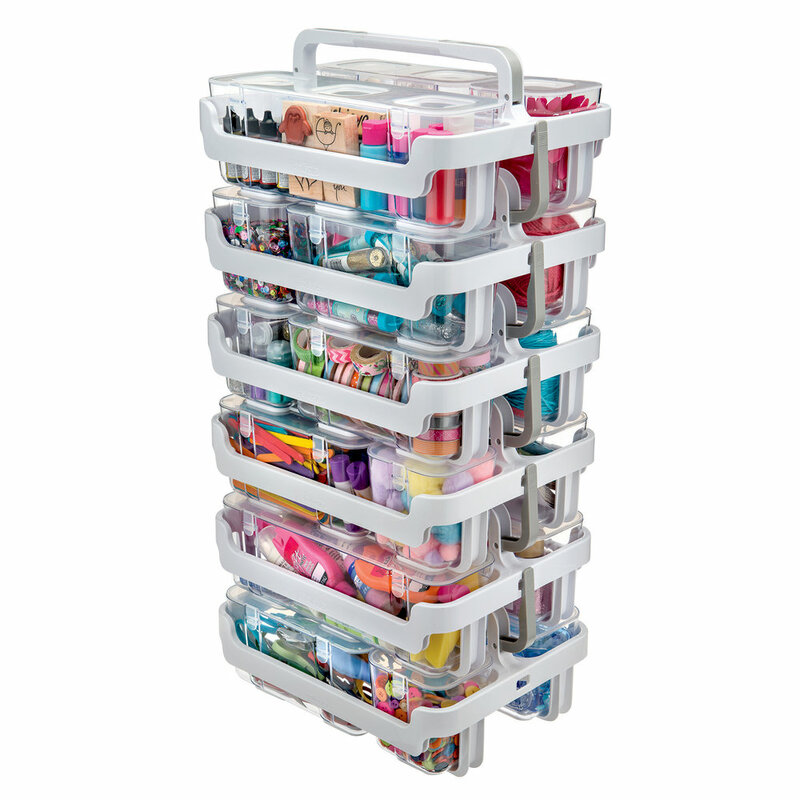 I love this product- it has really helped me to organize all of my products- I love that i can see everything in the cases. I also love the quality- very hard sturdy plastic. 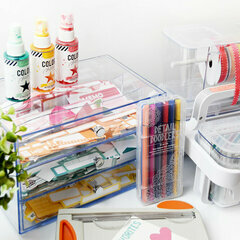 Perfect Organizer For Any Craft Room!! 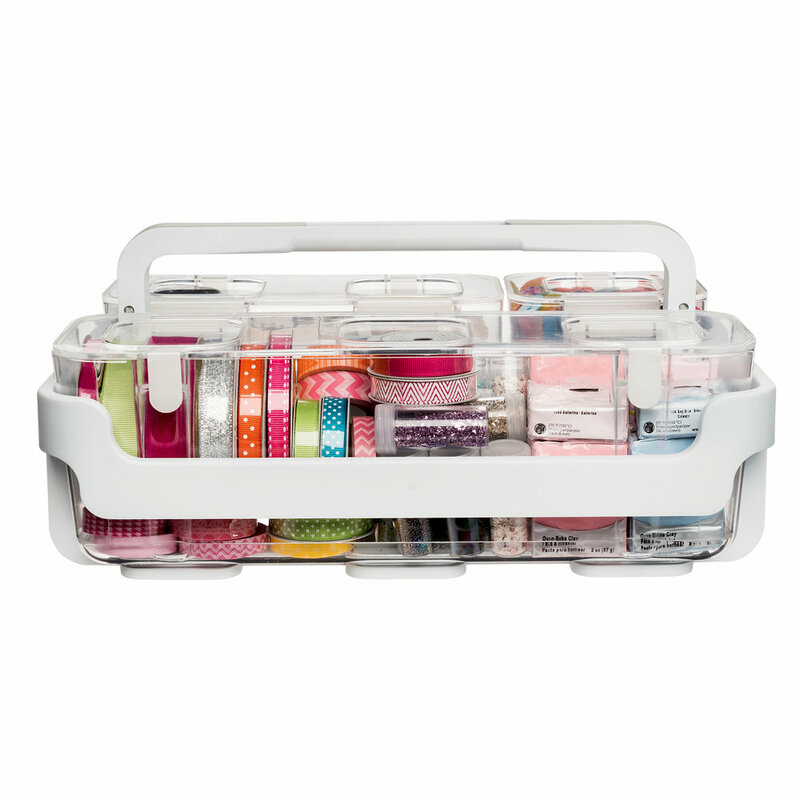 These caddies are perfect for any craft room. -It comes with three different sized containers. 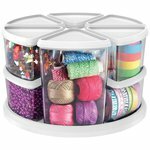 Which is perfect because you can store all kinds of different supplies in them. -The containers have a little lock so nothing is going to fall out. - And you can take them along with you to a crop. 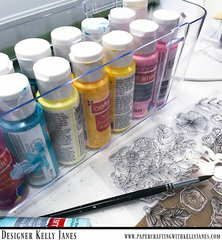 I used mine to organize my mixed media, everything fit in the containers nicely and I can find what I need easily. 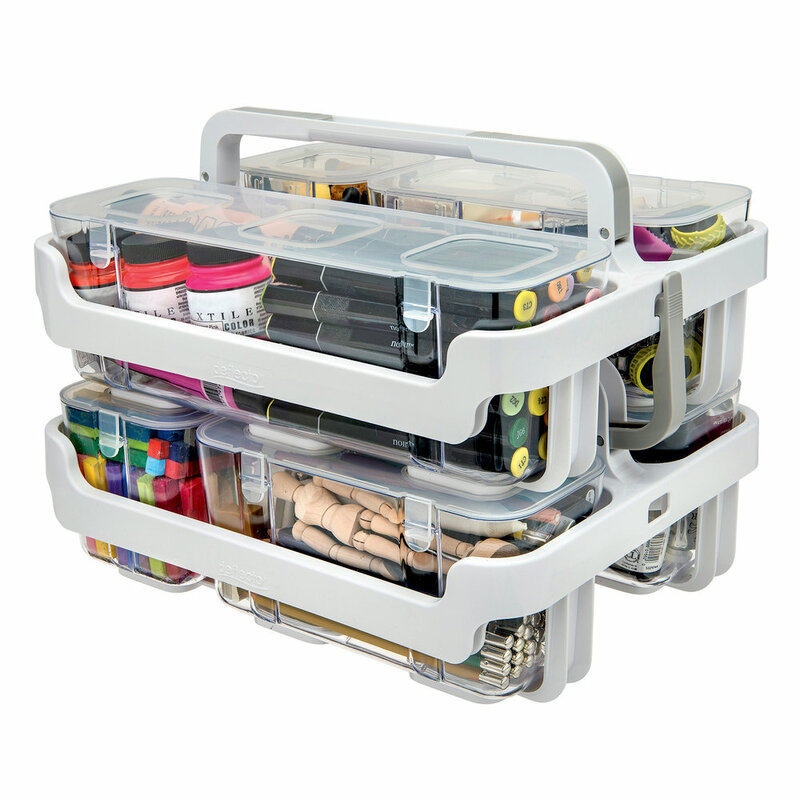 I definitely recommend this great organizer. I was really impressed with the design of this storage organizer. Now I want a few more. You can do so many different things with these and there's a video to watch with ideas for you. Great product!!!!! I absolutely love this product. This caddy has three different compartments. All three are different size with a lid that locks so nothing can fall out. The best part, they are clear, and you can see what is inside. The handle makes the caddy portable. You can move it from the Caddy Wheel Base to your desk where you work. Mine is filled with washi. I love that I can take just one compartment out, the one with my favorites inside, and have it right next to me while I work. If you have more than one Caddy, you can stack them on top of each other. If things get full and heavy, you can get a Deflecto - Stack 'n Go - Caddy Wheel Base. In addition, I think these are perfect for a teacher filled with their favorite goodies and supplies. 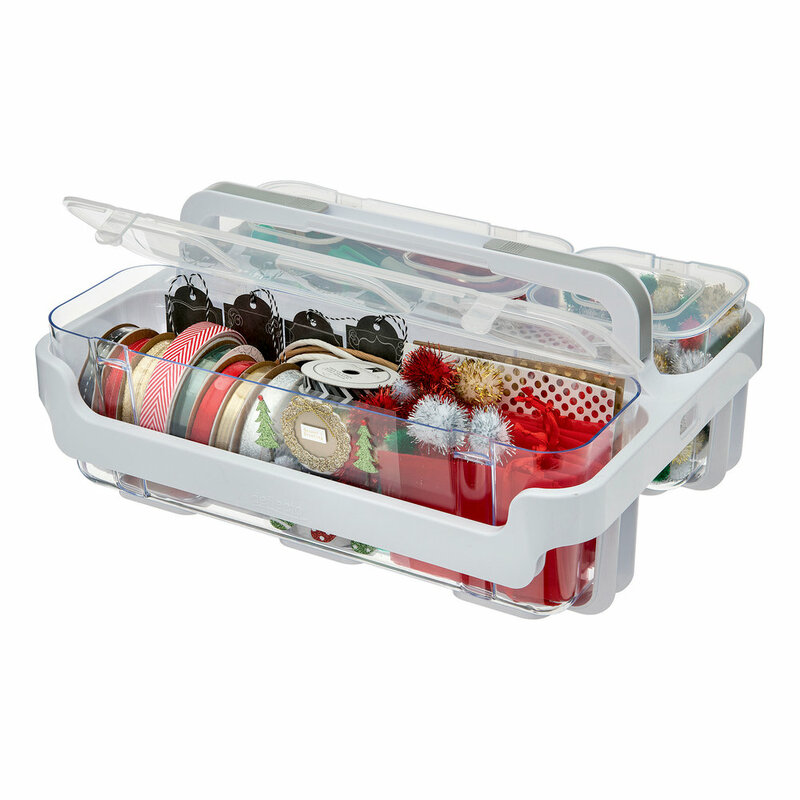 Perfect for organizing my craftiness! I am loving this handy dandy caddy! I used to have all my embossing powders, glitter, beads, etc in an open pin that I felt was "organized". With this caddy, I have created a one stop embossing station. I can put my embossing pads, buddy, etc in the small bin and fill the others with my powders making it easy to just grab and emboss. I even flipped all my powders over so I can immediately see the colors. Plus, it stacks so I can't wait to get another for other items. It's really awesome. I was surprised by how many items I could pack into this organizer! The bins are a very useful depth, and I like that they are divided up into small, medium and large. I had a tough time deciding to use it for either mixed media supplies or pocket album supplies. I went with pocket album supplies and have everything I need in this organizer to take it on the go or to put in another room. I can see that adding the base with wheels would make it even more versatile! I need to have all of my supplies stored in a way where I can see them and remember to use them. 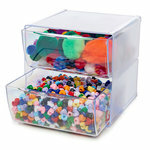 I love that these containers are clear and easy to reach for but also keep everything securely organized. I plan on getting a set of these to store my Bible Journaling Workshop supplies so I can take them on the go and have everything nicely stored and easy to see! How many pounds it has, when it's shipped By: distinguida102 (08-Sep-17) Helpful Question? Yes | No Thank you! Report Inappropriate This question has been reported. Thank you! Thanks for your interest in the Deflecto Caddy. The unit weighs approximately 4 lbs. By: Deflecto (09-Sep-17) Helpful Answer? Yes | No Thank you! Report Inappropriate This Answer has been reported. Thank you! 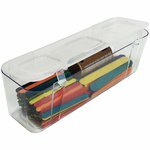 Does this caddy come with the storage organizers or do I buy them separately? By: eronymartin (05-Jan-17) Helpful Question? Yes | No Thank you! Report Inappropriate This question has been reported. Thank you! 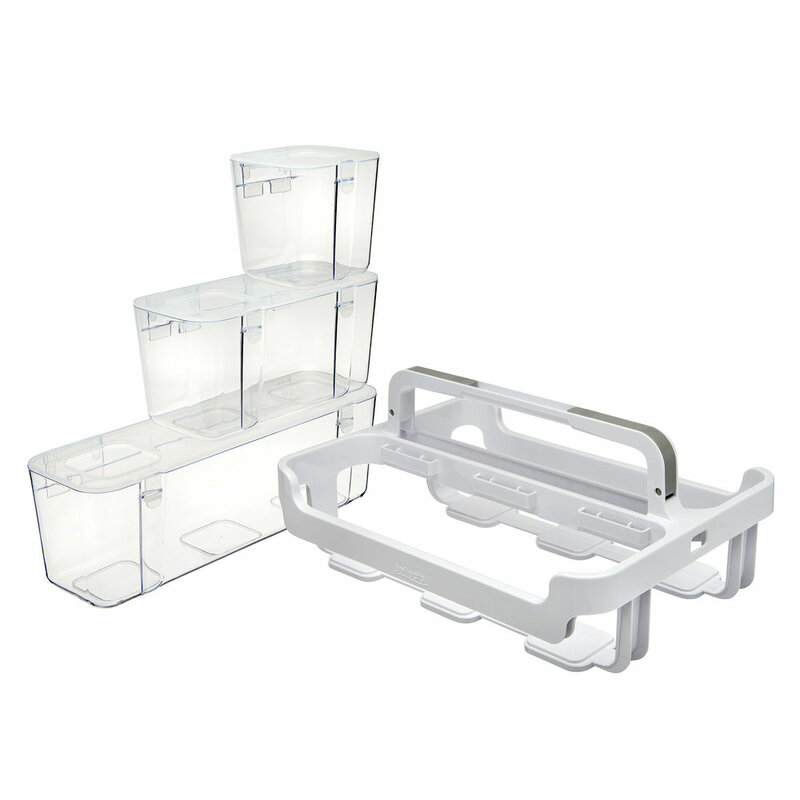 It comes with 3 removable storage containers: 1 large, 1 medium and 1 small. 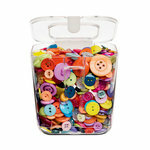 Additional containers can be purchased separately. The containers can be stacked or mounted on the wall with the mounting bracket. 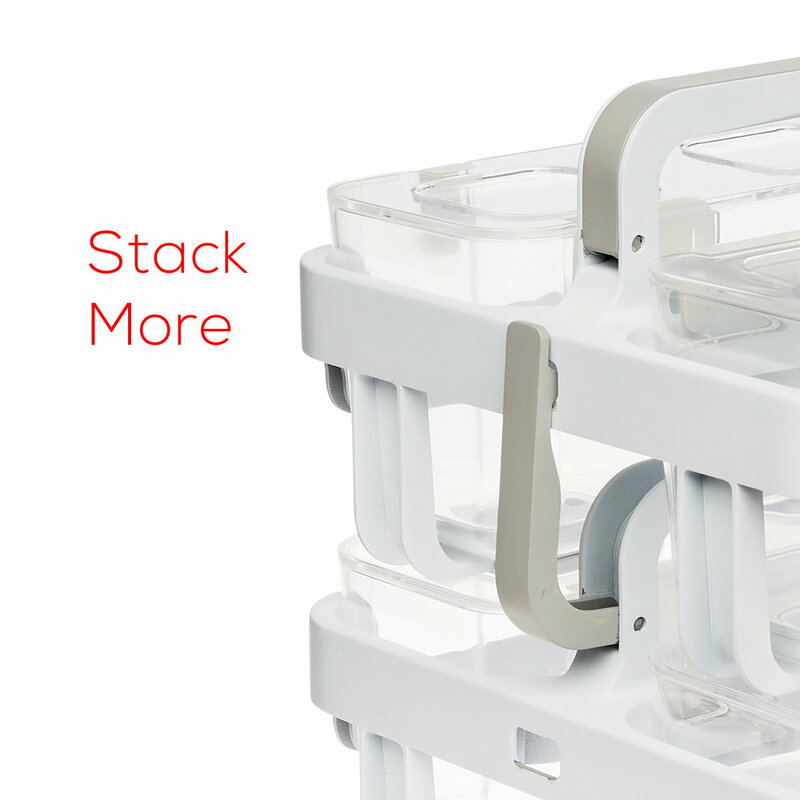 The caddies also can be stacked and locked together. Great on-the-go storage By: Deflecto (05-Jan-17) Helpful Answer? Yes | No Thank you! Report Inappropriate This Answer has been reported. Thank you! I could not understand the woman in this video at times. If she was given more time so she could slow down that might do the trick for those of us from different parts. &#128521; Thank you By: User (26-Jul-17) Helpful Question? Yes | No Thank you! Report Inappropriate This question has been reported. Thank you! Thank you very much for your input. I will make our marketing team aware of this. If you have any further questions on the Deflecto Caddy, I will be glad to help. By: Deflecto (27-Jul-17) Helpful Answer? Yes | No Thank you! Report Inappropriate This Answer has been reported. Thank you!